As I spoke about a few months back about Origins, Castle Dice is an amazing game. I’ve finally gotten around to getting a copy and providing a full review for you guys and I hope you wind up liking the game as much as I do. 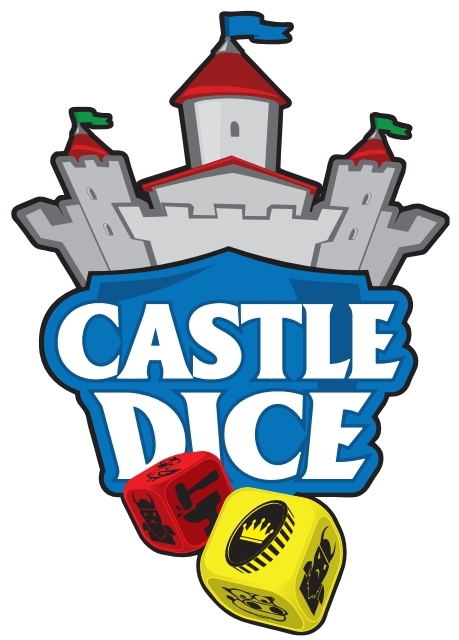 The basic premise of Castle Dice is that you’re trying to build the best castle in the land, you do so by gathering resources (via drafting dice) and turning them into castle structures, villagers, and more over a finite umber of rounds – whoever has the most victory points at the end of the game is the winner. While it is a simple play concept, Castle Dice is both involving and nuanced enough that you’ll find yourself playing it repeatedly, yet easy enough that you’ll be able to play with a younger crowd too. Speaking of the younger crowd, my son is in love with this game. I’m fairly certain that the lure at first was the colorful dice themselves but he really enjoys hoarding resources and building up giant towers and castle pieces in attempts to win the game at the last moment. Speaking of all of those alluring dice, let’s see what’s in the box before we jump into the rest of the review! Steal All The Lumber and Pigs! 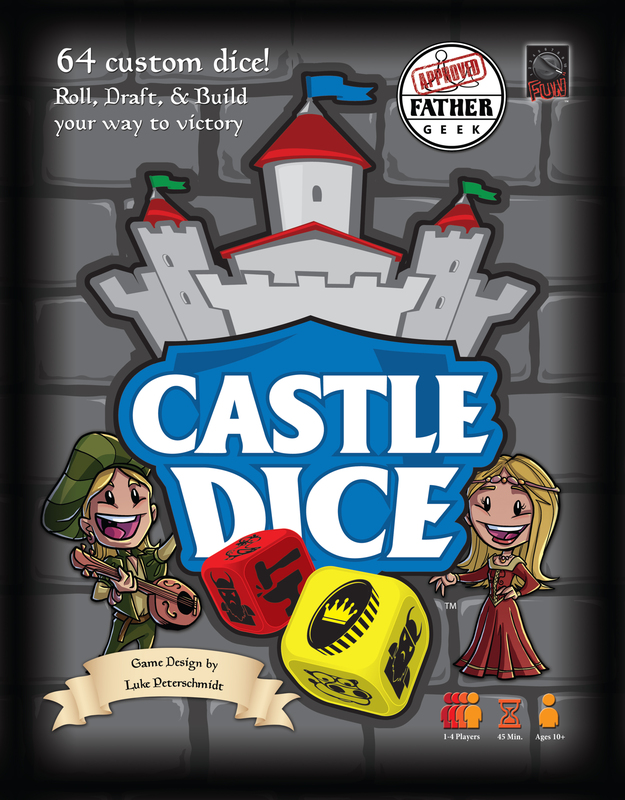 Castle dice is played over 7 rounds, each round players will draft dice from a pre-selected pool and then add in some additional dice of their choice as well. This is all indicated on the game board, the actual types and amounts will vary round by round and player actions such as playing cards that allow them to draft more dice. Speaking of cards, at the beginning of a round you have the option to discard as many of yours as you’d like and then draw 5 new cards. Of those 5 cards you have two piles to choose from, the village deck and the castle deck. 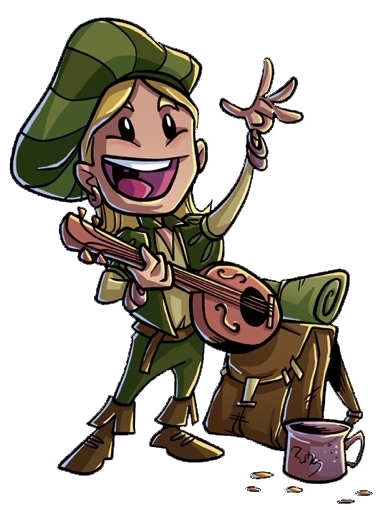 The village deck is full of resources that will help your economy by generating more gold or by providing farmers or even aiding you in defending against barbarians (who are huge jerks that deplete your resources, more on them in a minute) while the Castle deck is your bread and butter for victory points and is full of structures to build as well as a few helpful characters like the Sage, which can make a bad round good, and a good one great. You go around the table selecting the dice you want and adding the resources to your pool and after everyone has finished you all roll, this basically generates the world in which your imaginary little castle people will go out and harvest. Be careful though, for every barbarian you roll not only will that deplete the total resources everyone is drafting from, but they also deduct one of every resource you have for each one rolled at the end of your turn! So, after you’ve drawn cards, drafted dice and rolled them all into this huge pool (which everyone will draft from I might add, you don’t get your own private resource pool) players will take turns beginning with whomever is first and go clockwise around the table selecting one die at a time and adding its face up value to their resource. In order of rarity the resources are Wood, Ore, Gold, Land, and Iron and these are the things in which you’ll need to play the cards in your hand, which in turn give you victory points, which in turn will hopefully win you the game. Rinse and repeat for the rest of the game, sounds simple enough right? There’s a little more to it though you see, the game is also all about… barnyard animals. 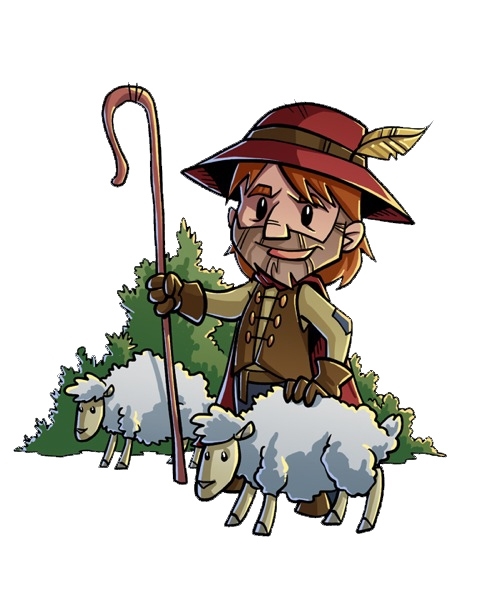 The first player is determined by whoever has the most horses, and the player who has the most chickens gets to have an extra card in their hand, if you have the most cows you can shift around your villagers once per round, and if you’ve got the most pigs you can Pork Chop! and take one of the dice on the table and choose any of its faces to add to your resource pool. All of these animals are found on faces of the dice when rolled, and you can draft them the same way you do all of the other resources. This makes drafting in Castle Dice fun and dynamic. I should mention also that every turn if you have one of each animal you have the opportunity to go to the market, which will in turn grant you a market card. You really want market cards. Market cards are drawn from a small deck at random and they may give you bonus victory points at the end of the game, allow you to gain a leg up over your opponents, or totally screw them over. If the round you’re playing is a “holiday” you *must* go to market if you have the resources to do so, you can’t avoid it because it’s a holiday. The quality of all the stuff that comes in the Castle Dice box is superb. There are tons of custom dice that have a nice weight to them and feel really good to roll and slide around on the table as you draft them. The cardstock boards for each player are super durable and thick and the glossy artwork on top is just great. The box is huge and has plenty of room for expansions and other stuff you might stow in the bottom like dice bags for players, etc. My only gripe with the components would be the glass beads used to slide along your resource counters as they are slightly too big to fit the artwork and the red color makes them hard to see though. The game probably costs an arm and a leg to produce though so I totally understand going this route with a cheap and readily available component like the flat glass beads. Castle Dice is a complete blast to play, it’s quick, easy to learn, and very fun – you’ll want to play it over and over. If you like light, easygoing drafting games or dice games at all, don’t hesitate to pick up Castle Dice. I wholly double this recommendation especially if you’ve got younger people in your life, I know the game isn’t really marketed as a kids game but I think it is just emanating geek parent potential. Obviously in a game that is full of dice, chance is a moderate factor here and if you’re not the kind of person who enjoys some randomness you might want to avoid Castle Dice, though there are plenty of opportunities to compensate for chaos theory within the game. Also, if you don’t like some randomness in your life – stop being a fuddy duddy and get off my blog! I’m kidding of course. I think that Castle Dice brings the perfect blend of drafting, chance, strategy, whimsy, knights, knaves, and barnyard animals to your kitchen table. You can’t take the game too seriously so fans Don’t miss out on this one if you can avoid it. This game has earned its spot on my primary game shelf and has forced another of my ‘all time favorite’ games into The Closet of Shame, the place where once great games go to die. You heard me right, Castle Dice is that much fun. Until next time folks, thanks for reading!